Now this project took a little longer than I thought it would. That’s me sorting my pattern stash. I’ve read about a million ideas to keep one’s stash in order; in good condition; and in check. And I finally did something about it. I put all the pattern envelopes into plastic sheet covers and then into respective binders, sorting by pattern type. 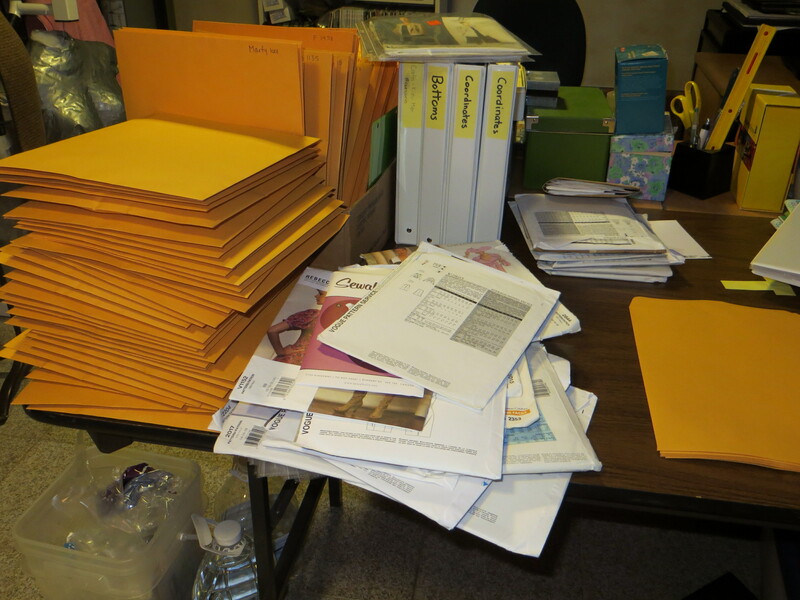 Then all the pattern pieces and the instructions went into manilla envelopes, which are filed numerically. I wrote the pattern numbers at the top RH corner of the envelopes and on the top LH horizontal edge. Mostly because I don’t know which way the envelopes will be filed once I get my sewing space pattern storage set up… after every other possible renovation project in this house is complete…. For now, the binders sit on the bottommost rung of a sawed-off bookcase, while the envelopes are stores in boxes and then stuffed into various nooks and crannies in the general sewing vicinity. I did this whilst waiting for restoration to end, and last week went on a cutting spree, piling up ready-to-be-sewn projects alongside my sewing machine until a sewspicious day comes along. Why didn’t I organize my pattern stash sooner? This makes choosing and finding what I want a fun experience, not one fraught with an overwhelming sense of being overwhelmed by the patterns themselves. Sounds very satisfying! I do something similar, though the last couple rounds of new acquisitions are still waiting to be processed. 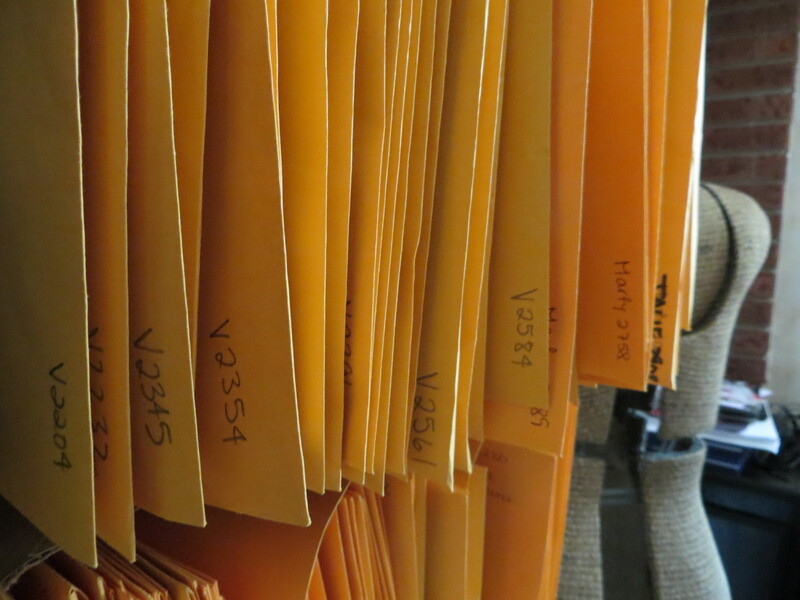 My pattern envelopes are roughly grouped by type, but not neatly filed in binders. I use the plastic sheets instead for the pattern pieces and the instructions & these go numerically into magazine file boxes. You say toMAIto I say toMAto! 😉 The only regret I have is not being able to integrate the magazine based patterns into this system. Surrounded by patterns! How wonderful. And now you know what you have and where they are. Hooray. I’ve done this and it is an interesting process. However, somewhere along the way I’ve given up on keeping it up. I hope it works better for you! OK, thats a great method. When can you come over and do mine? I bet you found things that you didn’t think you had or had been long forgotten – well done. That takes a lot of patience. I´m in awe of you! Very,very nice organization work you´ve done! Do you have a catalog somewhere of what you have so that you can easily search without having to go through every envelope? No catalog. Just the old-fashioned paper-in-a-binder! Now that is organized…having someone take your photo while you do it! Bravo! very organised…Im hoping your reno’s are coming to an end soon so you can get back into that sewing space! Great organization. Looks like it will be easy to now find exactly what pattern you want and get to the fun part ‘sewing’ that much sooner.